The Stonewall Riot on June 28, 1969 is often cited as the beginning of the gay rights movement: As police arrested employees and patrons of Christopher Street’s Stonewall Inn for serving liquor without a license, crowds threw rocks at the cops, and the event set off days of protest. But three years earlier there was another, little-known protest one block over on Tenth Street, a precursor to Stonewall that challenged a state law about serving alcohol to gays. It happened at Julius, the circa-1826 tavern at 156 West 10th Street. The place has operated as a bar since 1867, and it’s been called the longest-running gay bar in New York, though it’s unclear when it went from being a favorite of Longshoremen to a place favored by gay men. This description of Julius from a 1966 guidebook has it that it’s been attracting “improper bohemians” since the 1930s, though the bar website says the 1950s. The “Dirty Julius” nickname came during its days as a speakeasy. 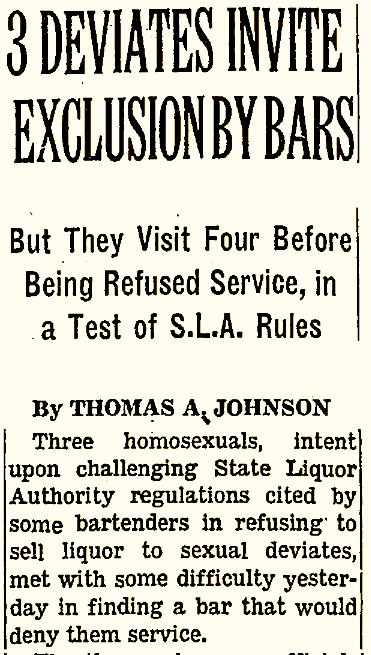 In any event, the protest came about because the Mattchine Society, an early national gay rights organization, decided to challenge a New York state law that prohibited bars from serving disorderly patrons. At the time, simply being gay was considered grounds for being disorderly. So on April 21, 1966, a small group of men took action. 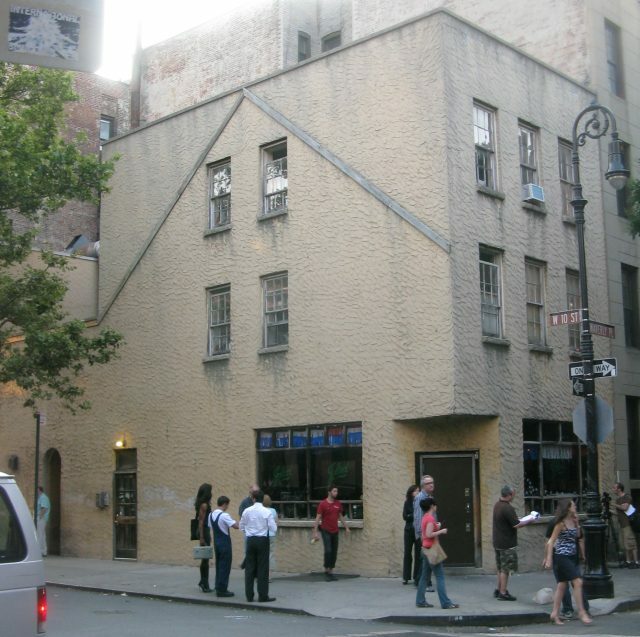 “With reporters in tow, four activists declared they were gay and asked to be served at Julius’,” states Off the Grid, the Greenwich Village Society of Historic Preservation’s blog. Julius is still in the West Village, of course; an old-school time machine of a tavern with beer barrel tables stamped “Jacob Ruppert” (ostensibly from Ruppert’s turn of the century Yorkville brewery) and an unpretentious 1950s feel. This entry was posted on June 1, 2015 at 4:07 am and is filed under Bars and restaurants, Out-of-date guidebooks, West Village. You can follow any responses to this entry through the RSS 2.0 feed. You can leave a response, or trackback from your own site. Julius’ has a featured spot on two of our Tours: the Greenwich Village Walking Tour [http://wp.me/P47lL1-Un ] and the Gay Village Walking Tour.[http://walkaboutny.com/the-tours/gay-village-walking-tour/]. 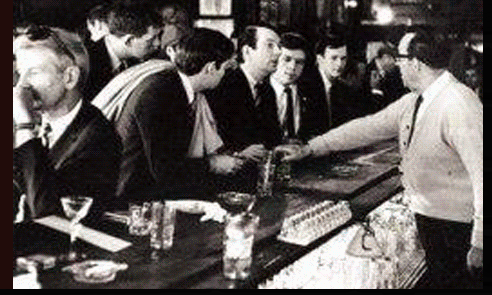 The Sip-In that was held there in 1966 is given its rightful due as the forerunner to the Stonewall Riots. In all likelihood the bar’s transition from a longshoreman’s hang-out to a gay one began in the late 1950s, continuing into the 1960s, as New York’s shipping industry declined. The piers at the end of Christopher St. and elsewhere along the waterfront no longer employed the men needed to handle incoming cargo. The bars in the Village that catered to these workers were forced to gradually changed their clientele to remain in business. We drank beer, the girls Whiskey Sours. I remember the waiter pitching the empty beer bottles into a trash can loudly shattering the glass. Anyone remember that.